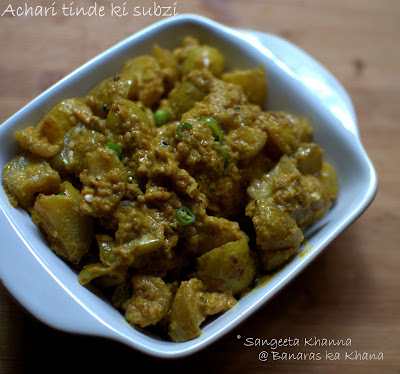 Dahi wale tindey or achari tindey as we call this curry, loved by both of us when cooked using baby tindey. What? You can't figure out what tindey is? Tinda (pl. 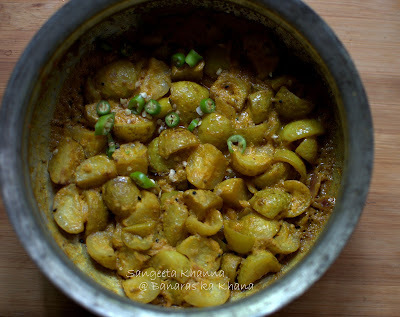 Tindey) is a gourd family vegetable which can be called an Indian summer squash as it comes in summers along with sponge gourds and ridge gourds. Called Apple gourd in English, it is shaped like apples, but the similarity ends here. This is one of those watery vegetables that gets squishy when cooked and most people dislike it for precisely this reason. If made into a hot spicy curry some people like it but we don't like much spices in summers so I go for a lentil based curry or a yogurt based curry for cooking this squash. The squishy texture is taken care of if you cook it with firm lentils like chane ki daal (split chickpeas) or green peas. 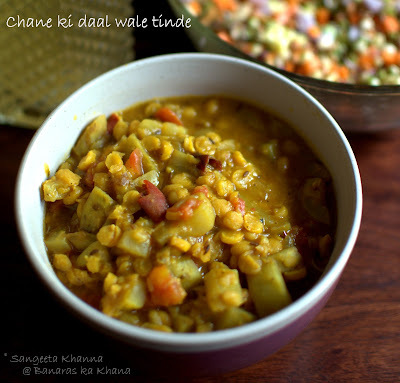 This recipe is simple, just boil some chane ki daal with salt and turmeric powder till done but not pasty. Stir fry some chopped red onions in ghee along with cumin seeds, add cubed tindey and tomatoes and stir fry till slightly mushy. Add minced ginger and chilly powder or chopped green chilies, a little bit of garam masala and mix everything well. Add this mixture to the cooked chane ki daal and simmer for a couple of minutes. Keep the consistency thicker than usual daals and have it like a subzi side dish. It can make a meal too if you add a few cubes of paneer to it. But the achari tindey or dahi wale tindey is a recipe that requires a bit of accuracy in cooking procedure. Firstly, you need baby tindas for this, secondly they need to be cooked just till they get a bit translucent but retain a bite. Not making it completely mush. It takes about 15 minutes to cook if you are doing 2-4 servings, but take care about the serving size as folks will be helping themselves 2-3 times with this flavorful curry. The consistency of the curry here is laga lipta type as we say in Hindi. That means a coating consistency of the gravy. Clean the tindas, discard the seeded ones. Quarter them all and keep aside. No need to peel the tindas as the baby gourds have very tender skin anyways. Pound the spices listed under 'spices to coarsely pound' and keep aside. Make a paste of the red onion and then blend in the yogurt. Keep aside. This can be done while the tindas will be stir fried for a while. Do as convenient. Heat the mustard oil in a shallow pan or kadhai (I used a copper handi, tinned inside) and tip in the minced ginger. Fry for a few seconds or till it gets aromatic and then add the quartered tindas. Add salt and red chilly powder and stir fry till a few pinkish spots appear. Now add the blended yogurt and onion, mix well and tip in the pounded spices, yellow mustard powder and the ginger powder if using. Mix again, bring the heat to lowest, cover the pan and simmer for about 10 minutes. It may get ready sooner if the tindas are really tender. Keep an eye and remove from the stove once it looks like this. The curry looks nice with a coating consistency of a dahi gravy when served. Roti, parathas or any Indian flat breads go really well with this curry. You might like this with a daal on the side or a meat dish may be. Slightly sour in taste, this curry gets a nice aroma of the pickling spices used. The bland taste of tinda gets a new makeover with yogurt and pickling spices. You can make this curry thinner in consistency if you like. This looks very nice...I like yoghurt based gravies..but sometimes the yoghurt gets cuddled on cooking...perhaps blending it with onion with take care of this? Yes Amrita, adding onions to the yogurt and blending them both together helps the yogurt to sauce perfectly.